Hello and welcome to the 230th installment of the SWD. Hayat Tahrir al-Sham’s commander Abu Ali Dumar was assassinated on the road between Idlib and Maarrat Misrin. Unverified, unconfirmed statement from the Free Syrian Army’s Tajmae Nasrat al-Mazlu claimed responsibility for the assassination, saying they’ve monitored Dumar for a long time. The statement also said that the group will continue to clean the northern area from the Hayat Tahrir al-Sham. Ahrar al-Sham reached several administrative decisions yesterday, firstly accepting Abu Adnan Zaitoun’s resignation as the group’s commander of the military wing. Abu al-Mundhir was appointed as Zaitoun’s successor, and Captain Hussein al-Shami as al-Mundhir’s deputy and chief of staff. Major Bassil al-Mawas (Abu Arab) was appointed as the deputy chief of staff for operations and Obida Khalaf (Abu Islam) was appointed as the deputy chief of staff for administrative affairs. It appears that yesterday’s reports about Syrian Arab Army capturing several localities from Hayat Tahrir al-Sham in the eastern Hama were false. Hayat Tahrir al-Sham’s director of media relations, Imad Eddin Mujahid, denied any SAA‘s advances in the eastern Hama countryside and said that the fighting between the two is still ongoing. Mujahid also stated that the SAA is in control of Jub al-Abyad and the eastern farms of Abu Lfa, from where they launched failed attacks. Syrian Arab Army-held part of Abu Lfa was hit by an SVBIED, driven by Hayat Tahrir al-Sham’s Abu Ali al-Jazrawi. According to the reports, several soldiers were killed and a tank and a BMP immobilized by the explosion. On Abu Dali front, Hayat Tahrir al-Sham backed by Jaysh al-Izza recaptured Tall Syriatel from the Syrian Arab Army, which the latter briefly captured yesterday. HTS & allies reportedly seized a T-55 tank and captured two soldiers after heavy clashes for the locality. Free Syrian Army’s Jaysh al-Izza released a statement saying they’ve repelled SAA & allies’ attacks on Tall Syriatel, Al-Zafriya and Al-Zahraa farm. According to the group, they killed 20 SAA & allied soldiers in the failed attacks. Hayat Tahrir al-Sham also clashed with the Islamic State around Aniq and Toutah. 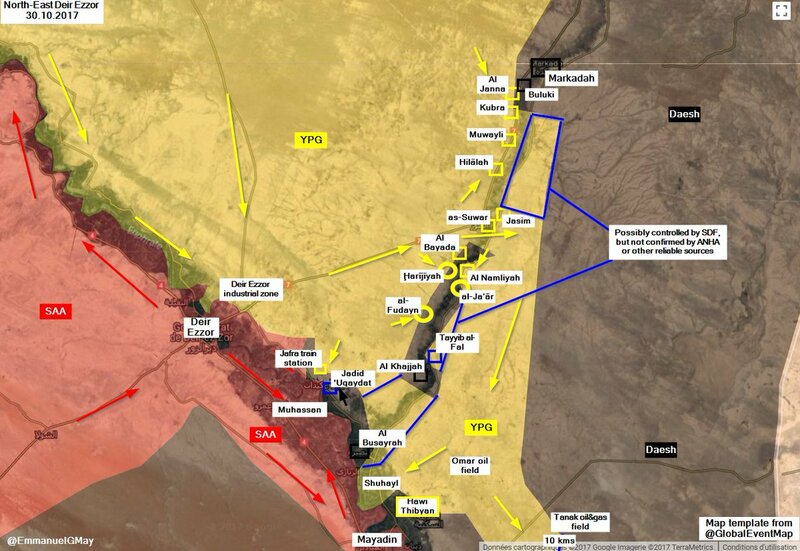 Syrian Democratic Forces reportedly captured Jadid Uqaydat, Al-Harijiah, Al-Andagy and Jaar from the Islamic State. Islamic State’s Amaq Agency reported that IS’ suicide attack targeted gathering of Syrian Democratic Forces’ fighters in Al-Harijiah. Syrian Arab Army and Islamic State continue to clash in the city of Deir al-Zour, with the former making limited advances in the city and capturing Industrial Institute. Russian Air Force conducted several airstrikes over Al-Hamidiyah district in support of SAA‘s operations, however, reports suggest that at least seven civilians were killed by the Russian airstrikes on the IS-held district. Syrian Arab Army, backed by allies advanced against the Islamic State 7 kilometers (4 miles) east of T-2 airport towards the Iraqi border. Joint UN-Syrian Arab Red Crescent aid convoy entered besieged East Ghouta through Al-Wafideen crossing. Aid convoy consisting of 49 trucks was destined for Kafr Batna and Saqba, but was reportedly stopped due to disagreement on who will be distributing the aid. Leadership of Faylaq al-Rahman demanded the aid be distributed by “The Revolutionary Leadership of Damascus and its Countryside”, while the UN rejected such notion and insisted the aid be distributed by the local councils. The convoy was reportedly parked at the checkpoint for hours, while the two disputed sides negotiated. In the end, convoy was allowed to distribute aid to the besieged civilians. Syrian Arab Army’s artillery targeted Mesraba, Harasta, Kafr Batna, and Saqba, wounding several civilians in the latter two localities. Last night, sporadic clashes occurred between Faylaq al-Rahman and Hayat Tahrir al-Sham in Kafr Batna, after both groups arrested fighters belonging to the rival group, the former committed the act first, to which the latter responded by arresting several figures of Faylaq al-Rahman mentioned yesterday. New dust storm hit Anbar governorate, slowing down Al-Hashd al-Shaabi’s (Popular Mobilization Units’) operations in the western part of the governorate. However, even despite the bad weather, Al-Hashd al-Shaabi made significant progress along the Iraqi-Syrian border, reaching Al-Qaim’s outskirts. According to the commander of the second brigade in Al-Hashd al-Shaabi, Karim al-Khakani, Iraqi forces are 12 kilometers (7.5 miles) away from the Obeidi area, which is adjacent to Al-Qaim. Islamic State’s improvised explosive device destroyed Iraqi Army’s Humvee on the road towards Rawa, according to the Amaq Agency. Iraqi Security Forces continue with anti-insurgency operations around the Baghdad, conducting operations in Al-Lahib, Albu Hussein, and Duilaybah. So far, the security forces have seized 14 IS’ improvised explosive devices and 22 detonators left behind by the Islamic State. Yesterday, Iraqi Security Forces conducted anti-insurgency operations in the southern Baghdad area, in Arab Alwan, Al-Askari, Al-Rasheed, and Duilaybah areas. Spoils from the operations are 16 IS’ improvised explosive devices and 25 60mm mortar shells. On the 28th of October 2017 CJTF-OIR has conducted one strike in Syria. CJTF-OIR‘s main focus in Syria at the moment is Deir al-Zour region where they did one strike supporting SDF‘s operations against IS damaging two IS lines of communication.